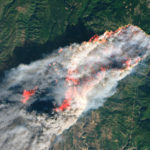 As extensive wildfires ravage swaths of Northern California, ASCE Region 9 Governor Matt Kennedy, P.E., ENV SP, M.ASCE, can only wait and hope. Kennedy, his wife, and their 5-year-old had no choice but to evacuate their Santa Rosa home Tuesday evening, on orders from the city, as the fires that have destroyed thousands of homes across the region drew closer to his neighborhood. 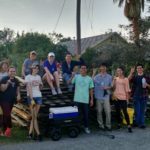 “We loaded up what we could, grabbed the valuables and essentials,” Kennedy said. The fires began Oct. 8 and blew rapidly across Napa and Sonoma counties. They have now been blamed for more than two dozen deaths and thousands of displaced residents. And this is an area that was already dealing with a housing crisis before this devastation. For now, Kennedy’s family is staying nearby with his parents. He returned to his home Wednesday by bike to check on things. 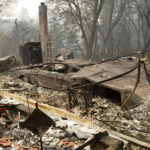 His house was without power as the fires pushed into adjacent Annadel State Park. Kennedy has a civil engineer’s practicality when it comes to his property. Kennedy said people are helping people – making sure the displaced have places to stay. Oct. 19 UPDATE: Kennedy and his family returned to their home Oct. 15. 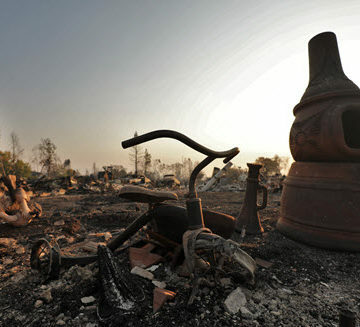 The fires crept close to his neighborhood, but no homes suffered damage.